Japanese food choices abound in the Skyview Shopping Plaza. Dera-Uma is an alternative if the queues at Menya are long and the tables scarce. Dera-Uma competes alongside Menya Mappen and Menya Oiden for attention, with prices that are a little on the higher side. There are some different choices, with the main selections including a bento box, Japanese curry, hamburger (the Japanese cutlet kind, not the American burger kind) and BBQ beef. The idea is you can mix'n'match a few smaller dishes and have a little variety. Toji-Oyakodon, $8.90 (large size). Despite the plastic disposable bowl, there was plenty of flavour hidden underneath the egg and chicken topping. A large size was fairly filling, it has three eggs used in the topping compared to two for the regular size so packs a protein punch. Ontama BBQ Beef $10.90 (regular size). A different type of don using chunks of BBQ beef and a soft cooked onsen egg. The beef was indeed hunky, the pieces were big for neat and polite chopstick work. Toji Salmon $8.90 (regular size). Just to try something different with egg topping, the salmon version comes with a generous portion of deep fried fish and the usual baked egg. The regular size was filling enough, especially with deep fried salmon on top. 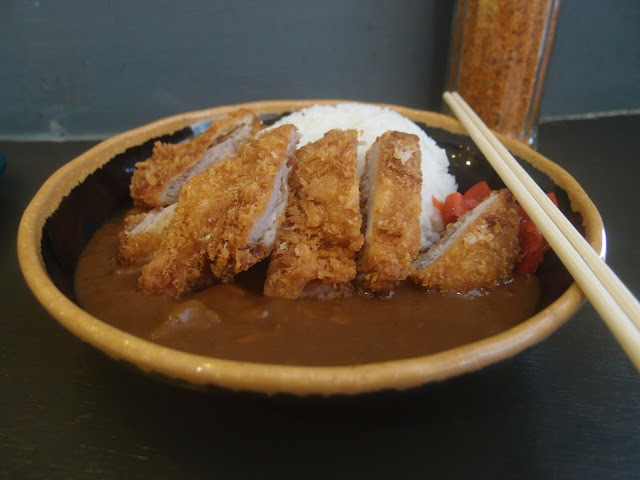 Curry and pork katsu, $9.90 (regular size). The curry was a generous serve of sauce with the pork katsu just poking in. This means you can distribute the curry as you need and not be left with just a whole big pile of rice. It's hard to get the sauce-to-rice ratios right when all you really want is the crisp crumbed pork and the curry sauce! There's plenty of room just outside with some solo eater bench seats along the wall. Sharing of tables is OK, in fact its expected so be ready to squish along if needed, especially if the queues at Menya are big. Dera-Uma is at Shop 6, Skyview Shopping Plaza, 545-551 George Street, Sydney CBD.